» Headline News » Feistner presents Fuel Up experiences at D.C.
Feistner presents Fuel Up experiences at D.C.
BAILEY FESITNER is seen here with a representative from the International Dairy Food Association. Feistner represented South Dakota for Fuel Up to Play 60 last week in Washington D.C. This past year, Bailey Feistner has served as the South Dakota State Ambassador for the Fuel Up to Play 60 program. Throughout the year, she has had the opportunity to promote the program during various workshops and events within South Dakota. Her goal has been to encourage other schools to be in the program and to share a student perspective of the program. 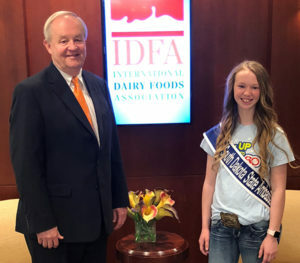 This past week, Feistner had the opportunity to present about her personal experiences with the program to the International Dairy Food Association and the MilkPEP in Washington, D.C. The Fuel Up to Play 60 program, sponsored by the National Dairy Council and the NFL, is the largest in-school health and wellness program. The goal is to encourage youth to lead healthier lives through proper nutrition and physical activity. Armando Rodriguez is the student advisor of the program at the Woonsocket School. Bailey is the daughter of Brian and Jennifer Feistner.